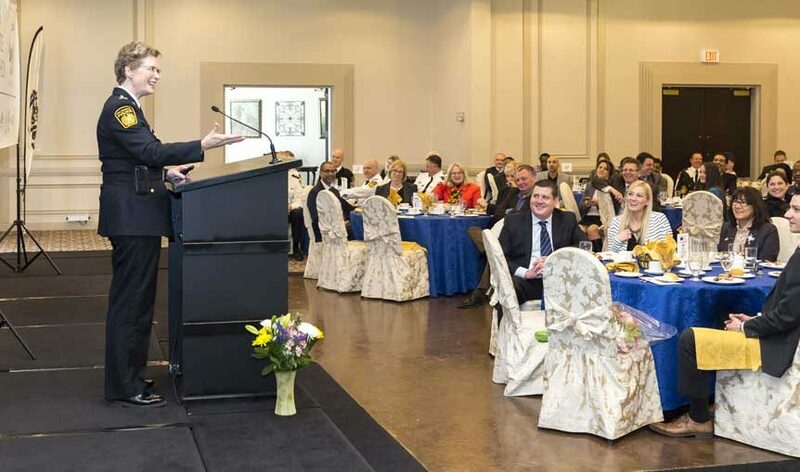 MISSISSAUGA, ON – On April 8th 2016, Peel Regional Police’s Chief Jennifer Evans delivered the annual “Policing in the Region of Peel” address to over 160 decision makers and community leaders at Safe City Mississauga’s Justice Luncheon. This year the event was held at the Mississauga Grand Banquet Hall. provide to attendees. This event is a great networking opportunity for police, government officials and community leaders as it provides a venue to collaborate and build community partnerships that will assist in creating a crime – free Mississauga together. “Our successes at Safe City Mississauga are not achieved alone, they are because we all work together as a collective for Mississauga and we come out of our silos of organizational missions and comfort, and we do this in an effort to continue to make Mississauga the safest city in Canada” said Ashley Lyons, Executive Director, Safe City Mississauga. The Justice Luncheon is Safe City Mississauga’s fundraiser. All proceeds from the event support Safe City Mississauga’s current year initiatives such as after-school programs, school services, Neighbourhood Watch, anti-graffiti toolkits, and awareness campaigns.